IT managers at companies of all sizes in any industry often have to manage their data without a clear picture of what they have and how valuable it is to the organization. A key first step is to be able to identify rarely or never accessed data to enable key data to be scrutinized effectively. QStar Storage Reporter provides key statistics on existing storage infrastructures without interrupting business operations. Storage Reporter will take just a few hours to perform an assessment of storage rather than the weeks normally required to carry out such a task. Storage Reporter is simple to install and run. Results of the scan are stored in a database, allowing many reports, like the ones below, to be generated without the need to rescan each time. 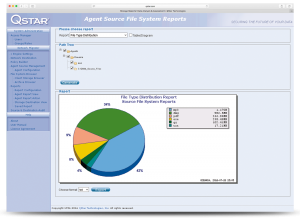 QStar Storage Reporter means that storage infrastructure optimization is really just a click away. 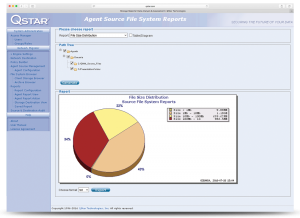 QStar Storage Reporter lets you perform detailed analysis of data composition in the existing storage infrastructure. The majority of files are rarely accessed more than 30 days after their creation, and many are never opened twice. The majority of unchanging data stays online by default, often on expensive primary storage disks. Holding so much unchanging data in the original storage locations is extremely costly over the years. QStar Storage Reporter together with QStar Network Migrator is extremely effective in limiting storage costs, whilst enhancing data protection. But more importantly, we offer a better data awareness and turn it into business value. QStar Storage Reporter (QSR) helps organizations make more informed decisions for storage investments and storage utilization, by executing a complete professional analysis of their storage infrastructure. The reporting software does not require installation on production servers, but can be installed on a networked workstation, running Windows or Linux. The desired storage resources can be targeted and file usage analyzed transparently to users, without workflow disruption. Once analysis is complete, results can be displayed graphically or non-graphically, profiling storage volume usage on the basis of File Access, File Size, File Type, File Owner, and Storage Utilization. Key report formats are conveniently pre-configured and results can be displayed graphically or non-graphically (table format). Custom reports can also be created, as needed. Any report can be exported as a txt or xml file, by selecting the Export button. Once exported, the file can be opened using MS Excel. Running Simulated Reports is a way of determining how the storage would look after a migration has taken place. In order to create a Simulated Report a policy must be created. 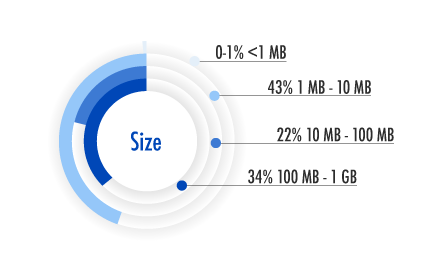 Example 1: The figure shows file size distribution; the increments can be varied to fit individual users’ requirements. Example 2: The figure shows file type distribution across the primary storage environment. Example 3: The figure shows how long ago files have been modified. A table can also be produced and downloaded via XML format. QStar Archive Storage Manager (ASM) creates an Active Archive environment as a standard NAS-based file system using NFS and SMB protocols or S3-based Cloud APIs. Tape Libraries, Object Storage, Cloud Storage (Public, Private or Hybrid), WORM and Optical Libraries are managed transparently like a single point mounting file system or Windows folder. Users see standard file shares and can easily search, find and retrieve data directly from the Active Archive. The hybrid architecture uses different types of tiered storage (including Cloud) to provide high performance and much lower running costs than standard magnetic disk-based architecture. 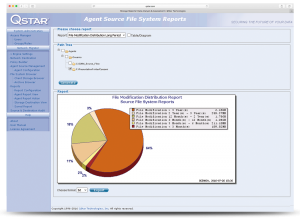 The QStar Archive Storage Manager introduces a software layer that allows the existing file system to expand over disk and many archive technologies, giving organizations a continuous view of the contents of their archives, making it easier for them to access files whenever needed. Users and applications access storage resources such as Tape Libraries, Object Storage, WORM, Optical Libraries and Cloud from local infrastructures through either NFS, SMB or via HTTP or S3 APIs.